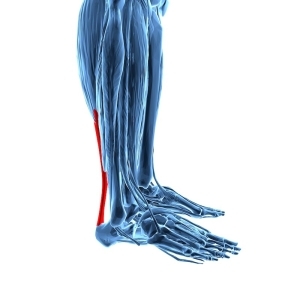 1 What Is Achilles Tendonitis? The Achilles tendon, which is sometimes called the heel cord, is known to be the toughest tendon in the human body. It is one of the longer tendons in the body as well, stretching from the heel to approximately the middle of the calf. The Achilles tendon allows for extension of the foot and pointing of the toes. The functions of this tendon make it essential for walking, running, and jumping. The downside for this prominent tendon is that it is commonly injured. While it has the ability to withstand the demands of walking, running, and jumping, it is prone to tendonitis. Simply put, tendonitis means tendon inflammation. Achilles tendonitis is usually associated with overuse and degeneration and is often characterized by tendon deterioration and tissue disorganization. Typical symptoms of Achilles tendonitis include pain, swelling of the ankle, decreased motion of the ankle, and decreased strength. The pain that is associated with Achilles tendonitis ranges from mild to severe, and it may come on gradually or suddenly. In addition, patients often report increased ankle stiffness in the morning and increased pain with physical activity, including walking and running. In order to properly diagnose Achilles tendonitis, an assessment by a qualified medical practitioner is necessary. The assessment will include a detailed history of your injury that includes questions relating to the location of your pain, the mechanism of injury, the onset of symptoms, and particular details relating to the symptoms you are experiencing. A physical exam consisting of palpation of the tendon, muscle strength testing, sensation testing, reflex testing, and orthopedic testing may also be performed. Additionally, your doctor may order special diagnostic tests such as X-ray, ultrasound, or magnetic resonance imaging (MRI) to further assess your condition. Oftentimes, patients describe their Achilles tendonitis as occurring abruptly. However, research has suggested that Achilles tendonitis develops more gradually. Anyone may be affected by Achilles tendonitis, however individuals who participate in high levels of physical activity, particularly activities that involve running or jumping, are more at risk. Additionally, those who only exercise occasionally or who suddenly drastically increase the intensity of their running program are commonly affected by Achilles tendonitis. 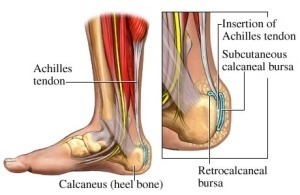 Achilles tendonitis is usually caused by repeated use and intense strain on the tendon. Additionally, the Achilles tendon weakens with age, making it more susceptible to injury. Thickening and increased thickness of the tendon can be caused by overload on the tendon. If this overload continues, the tendon becomes stressed which may lead to a disorganization of the tissues in the tendon. Chronic stress and overload on the tendon may eventually lead to degeneration. Patients that suffer from chronic Achilles tendonitis are more at risk for complications because degeneration and disorganization of the Achilles tendon that reoccurs may lead to small tears in the tendon. These small tears may not completely heal which causes the tendon to become weak, making it more susceptible to more serious injuries, including tendon rupture. Achilles tendon rupture requires immediate medical attention. Many patients who have mild Achilles tendonitis can be treated with conservative treatment methods. These treatment options may include rest, ice, elevation, physical therapy, as well as over-the-counter anti-inflammatory medications (non-steroidal anti-inflammatory drugs, commonly referred to as NSAIDs). Utilizing a variety of treatment options will help to reduce the swelling and pain associated with Achilles tendonitis. Patients who suffer from chronic tendonitis that persists may require additional treatment options that may include using a cast, boot, or brace that reduces the risk of stress on the tendon while it heals. Additionally, if the chronic pain is debilitating, steroid injections may be offered. There are two types of steroid injections that can be offered to patients suffering from Achilles tendonitis: intraarticular and periarticular. In the case of an intraarticular injection, the corticosteroid is injected directly into the tendon. For a periarticular injection, the corticosteroid is injected into tissues that surround the tendon. While a corticosteroid injection may provide relief, it is important that patients discuss this treatment approach thoroughly as it has been associated with an increased risk of a ruptured Achilles tendon in the future. Patients who suffer from Achilles tendonitis are advised to allow time for the tendon to fully recover before returning to regular physical activity such as sports or working out., Full recovery may take weeks to months. It is important to ensure that the tendon is fully healed before resuming normal physical activities, even if the pain, stiffness and muscle weakness are no longer debilitating. If conservative treatment methods fail, your doctor may suggest surgery to repair the injured tendon. With severe cases of Achilles tendon injury, such as a tendon rupture, surgery is always warranted. Pain, ankle swelling, and ankle stiffness are common symptoms of Achilles tendonitis. Even though many patients state that their pain came on suddenly, it is more likely that the injury occurred over time as the tendon became weakened and degenerated. Although the risk of injury is higher for high performance athletes, those that lead sedentary lifestyles may still suffer an Achilles tendon injury. There are a variety of effective treatment options for Achilles tendonitis. Speaking with your doctor will ensure that you receive the most appropriate care for your condition. Stretanski MF. Achilles tendinitis. In Essentials of Physical Medicine and Rehabilitation, 2nd Philadelphia: Saunders Elsevier pp. 407-410.